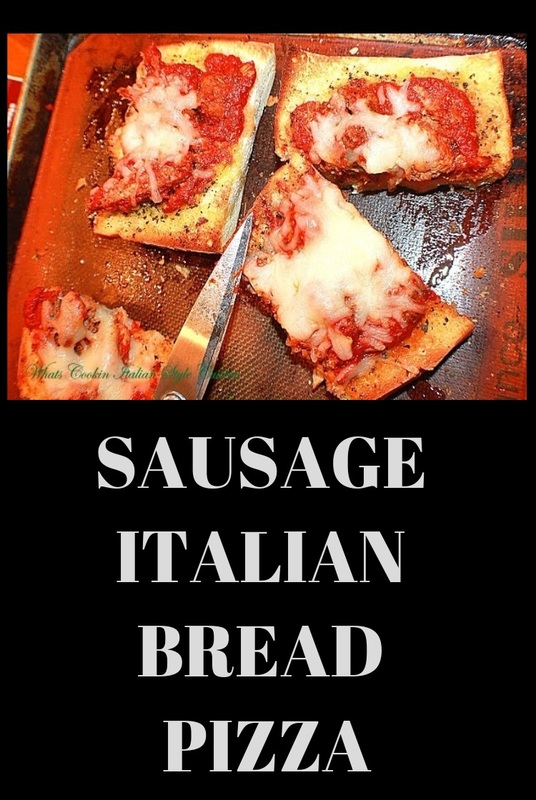 If you want a easy quick meal for the family this sausage Italian bread pizza is the perfect solution. 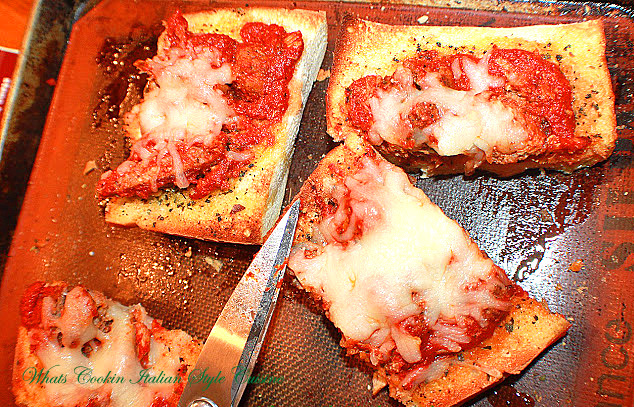 Sausage Italian bread pizza is or favorite topping but add whatever you like one it! This happens to be leftover Sunday Sauce with sausage and meatballs were in it, so I just crushed up the sausage and viola, instant pizza to french bread. When I have no time to think of making a big meal this is always a satisfying solution. The kids like it plain, my husband like pepperoni or sausage. The pizza topping gets either whatever is leftover or in the refrigerator. I have made buffalo pizza with leftover chicken and hotsauce, pineapple and ham, shrimp with garlic and oil, olives, peppers and chicken roasted. The combinations are endless. Think of this as an open top sandwich. For me all vegetables. Try eggplant parmesan on top! Keep Some Staples Always on Hand! You can adapt this with your favorite toppings your use to and make your own combinations. Some good idea's are to keep olives, mushrooms, peppers, cooked meats, even ham and pineapple on hand in the cupboards and refrigerator. Store bought whole loaves of Italian or French bread used, can be the perfect meal and if you cut it in half lengthwise then in half again you can please everyone in your family to the toppings they love! The kids love this one! I may have to warn you though they are so good, you may have to make two! When things were tough and money was tight, mom would make pizza using all kinds of bread. She called it poor man's pizza. The Sausage Italian Bread Pizza was made with day old Italian bread. However, many types like bagels, english muffins, pita bread were among the other crusts she would use for this pizza. Brush the top of the sliced bread with olive oil. Sprinkle generously with herbs and granulated garlic and lots of grated cheese. Toast under the broiler on low until browned. Top with sauce, meats and cheese. Drizzle with more olive oil. Bake at 400 degrees until cheese melts. They look really yummy! A great way to use up the leftovers. I need to plan on making some meat sauce and then pizza a few days later! What a delicious idea using French bread instead of crust!